Showing results for tags 'anglo concertina'. Pirate Songs for Concertina - new book! Squeezers In Concert Friday, May 5 7:30-10 pm at Seekers Church $20 nonmembers, $10 members The Squeezers, a trio of veterans of the Washington Folk Festival, FSGW Midwinter Festival and Takoma Porch, are a “genre-defying” squeezebox trio squeezing tunes of the world from bellows-and-reed instruments of the world. Traditional Morris tunes, French bal-folk dances, Jazz standards, tango and original arrangements of traditional music highlight the versatility of these cross-cultural instruments and artists. Sarah Murdoch-Vocalist From old murder ballads to Nina Simone by way of old-time gospel, Sarah Murdoch’s voice is both sweet and mighty, like a steam locomotive burning daffodils. She is a New York singer and actor; a regular of NYC pub sings, you’ll also remember her voice and style if you’ve attended Youth Trad Song Weekend in the past two years. Talisk - Ballyhoura. Another One From This Great Trio! Episode Four! I'm now 2 weeks into teaching myself the Anglo. https://youtu.be/N030nWaL-NM In today's blog I talk about (and play) two tunes - Boys Of The Town and The Lilting Banshee. I also discuss a bit of DIY tuning of my Rosetti Rambler!! Anglo - What To Buy Next? 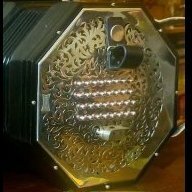 Stagi Anglo "Gremlin", 30button C/G concertina in excellent condition. There is a hard shell case included. I've had if for a couple of years, but have played it very little because I was tempted by another concertina and ended up buying both in a relatively short time. For now, one seems sufficient. There is a slight press mark on one side, but you would have to look very close to ever see it. The concertina is black, if you would like to see pictures I can email you or text them to you. $1165 new. Asking $450. Anglo Concertina "o, Du Lieber Augustin"
Viennese song for Anglo Concertina "O, Du Lieber Augustin"
Robert Burns: "the Winter It Is Past"